Diversification is an essential risk-management tool achievable by investing in a variety of assets with a low positive correlation on returns to reduce cumulative risk below the weighted average of the portfolio's constituent assets...or by hiring a financial adviser. Now diversifying their gear portfolio, Brixton. Started by three Oceanside dudes who met working for action-sports publishers TransWorld Media, Brixton first made a name for itself with headwear before steadily branching out to a full line of "vintage looking products with a contemporary fit and style" (hey, if it works for Betty White...). Their latest, most-expansive-yet collection ranges from the dual-pocketed cotton plaid "Memphis", to the single-pocketed, 1950s baseball-styled "Detroit" 3/4-sleeve, to graphic numbers like "Wander", depicting two guys sitting on railroad tracks, hoping there's truth in the saying "Ho-Bo Knows". 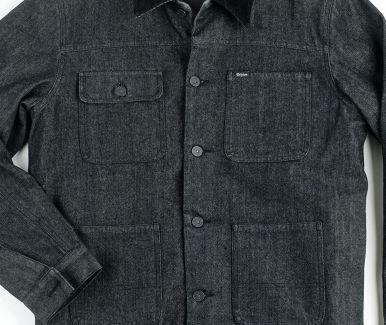 For heavier torso coverage Brixton's rolled out surplus-esque crew-neck sweatshirts and jackets ranging from the black-denim "Freight" to the black-satin lined, military-inspired "Debaser", plus a bulletproof-looking vest dubbed "Ruger", likely named after the gun manufacturer who controversially denounced automatic weapons, thereby shooting his product development team in the foot. 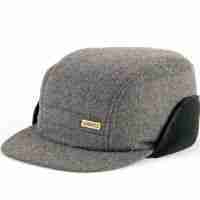 Sticking to their guns, Brixton's also updated head coverage, with new colors and tweaks on existing faves (the round-top bowler "Pack", the herringbone or corduroy "Fiddler"), plus one ltd-edition collab: a fleece-flapped wool cap called "Krooked" -- a bad sign if it describes your Capital Allocation Line! Oh. No worries -- just call Irv.